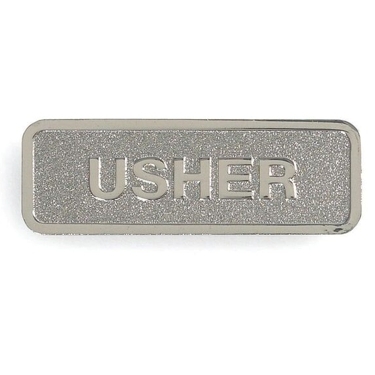 Usher badges are manufactured from a zinc alloy, which allows for a strong, yet very light-weight badge. Each badge is designed so that a blank name card can be inserted into the channel in the frame. These badges feature a magnetic attachment for easier placement on a variety of clothing. The header card Includes a warning for wearers of small electronic devices, such as pacemakers, as the magnets may negatively impact those devices. A free on-line template with instructions and suggestions is available at www.bhpublishinggroup.com.